It’s not hard to watch a Richard Linklater film and fall in love with his style and characters. Whether he’s making a romantic trilogy, following a bunch of stoners on the last day of school, or taking twelve years to show a young boy grow up, Linklater presents that slice of life that we can all relate to in some fashion or another. 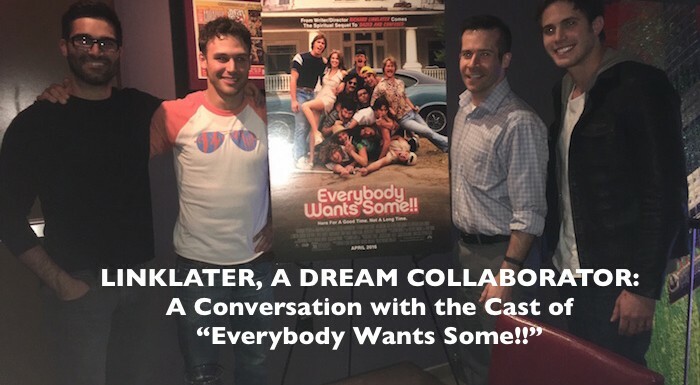 His new film, Everybody Wants Some! !, is considered the “spiritual sequel” to his breakout cult film Dazed and Confused. It’s a wonderful look back at those three days leading up to the first day of college. I was part of a roundtable discussion with three other film critics: Ryan Sanderson (Minnesota Connected), Jonathon Sharp (WCCO), and Joe Botten (The MN Movie Man) and talked with three of the hot, young stars of the film: Blake Jenner, Ryan Guzman, and Tyler Hoechlin. It’s very evident in the film that the cast has get chemistry together, and it still carries over long after filming wrapped. Like his character, Jenner still receives that “freshman hazing” from Guzman and Hoechlin. It was a pleasure getting that behind the scenes look of what it’s like to work with Linklater and how their past experiences with sports played a factor into their work in front of the camera. Ryan Sanderson (RS): It’s being billed on the poster as the “spiritual sequel” to Dazed and Confused. What does that mean to you? Blake Jenner (BJ): I think what it means is that it’s not a sequel with the characters from before. I think it’s the tone. What it’s like growing up and having that experience. Joe Botten (JB): All of you have a history with sports, how did you bring your history with sports to acting? How does that influence your acting? Tyler Hoechlin (TH): I started acting when I was 9, but I’ve been playing baseball forever. I’ve grown up with both. Baseball, specifically, is such a game of failure, and you learn more from your failures than success. It definitely helps with being persistent. You have a bad game, go 0-4, and you have to get up the next day and play again. It’s the same thing with acting. You have a lot of auditions, and you get a few of those jobs. I think the mental aspect to just brush it off and keep going has been the most helpful thing for me. Ryan Guzman (RG): I was a pitcher back in college…so being a narcissist…But with being a pitcher, you have to take it second by second. A good hitter these days is hitting .300. He’s only getting 3 out of 10. That’s kind of crazy, so the competitive aspect too. I always compete with myself rather than anyone else. The second I try to outdo someone else’s performance; I take away from my own. There are different things to take and give from the athletic word to the theatrical world. Paul McGuire Grimes (PMG): Describe the Richard Linklater set. Is it as easy-going and collaborative as it seems like it would be for anything that he works on? RG: Yeah. It’s a dream. PMG: Is it a lot of improv? Did you draw upon your experiences to base the characters on? Or was it all scripted out? TH: Improv is a strong word. With improv, you show up with a structured idea and then you just kind of “go”. We workshopped the script really well. So we had three weeks of rehearsal beforehand on Rick’s property, and then we would go have a script reading every day. Some days we would work more on the page and then some days he would say, “Hey, have you been talking about certain ideas?” He would encourage us to talk about different ideas away from the reads to see what we would come up with. Some days he would say, “Feel free to try some stuff this time,” and if he liked it, he would make notes of stuff and it would be in the next draft of the script. We worked it out really well. Every once in a while on set something would happen, and he always encouraged that if an accident happened to go with it to see where it goes. Jonathon Sharp (JS): The film says a lot about you guys with the chemistry on screen. Did you guys do anything outside of rehearsing? RG: Every day. Every second. Every minute. We lived together for two and a half weeks at Rick’s place in bunk beds. We were literally sleeping on top of each other and just hanging out. Anytime we weren’t working, we would come to set and hang out and watch, cheer the guys on. Those were some of the best times I’ve ever had being part of a production. BJ: I always say 100% that some of the most important homework we could have done was living together for two weeks so we could really get to know each other and really got to form a bond. We got to form our own little inside jokes. I’m totally grateful for that time. JB: When you were on Rick’s estate, you watched movies every now and then. Was there a certain movie that you saw during that time that was influential? BJ: I really loved the Doc Ellis documentary, No No. RG: We also watched another documentary about one of my favorite collegiate coaches ever, Augie Garrido. It was a dream of mine to go to UT, so to meet him and talk to him after watching the documentary was incredible. TH: I liked Animal House. It was fun to watch that with the guys. I think all in all it was great to have a little Q&A discussion session with Rick afterwards to feel out what he wanted us to take from each one we watched. Sometimes it was an attitude; sometimes it was a swagger, a feel. It was really cool to sit there with him and discuss these films to hear his point of view; then us as a group to find something to take away and apply to this film. PMG: Tyler, when you were younger you worked with Paul Newman [in Road to Perdition]. Did he give you any acting advice that you’ve been able to carry on and use? TH: You know what was great on that set was that those guys were, in a weird way, similar to Rick; very much trusting that I was able to do what I was supposed to do and needed to get done. So really what I got was through observing. They were more than happy to have a conversation about whatever would come up, but it didn’t feel like I was being watched and judged by my coaches. They were just there playing with me. That’s what we were doing, just trying to find a way to make a great movie. Definitely learned a lot from everybody on that set. Again, it was very trusting and great professionals. PMG: Was Tom Hanks as nice as everyone says? TH: The nicest human being the world. Absolutely. Hands down. JS: Is Dazed and Confused one of the films you guys watched? JS: Have you guys seen it? JS: How do you think Rick approaches college differently versus high school? RG: I think high school is more “succumbing to the man”, being told what to do, living under a regime. College is more of a free experience, finding out what you are capable of. Two different experiences, two different time periods, two different ways of telling a story. RS: Since the film is about growing up at a certain age in life, you guys are playing characters but you’re also at that age, so what do you take away from the film? BJ: Just with all of the distractions there are today with social media, the Twitter, the Instagram, everything’s so abrupt and direct and immediate. You find yourself thinking about the past, the future a little bit more than you should. I think what this movie does so well is teach everyone to live in the now, and be grateful for the first three days of something because it could affect you for the rest of your life. You might look back on it and write a movie about it. RG: I think there are many messages throughout the whole film. There’s a couple that stick out to me. One is letting your inner strange out, not letting judgment force you or put you in a corner. Just being true to yourself and going that route, among other messages. TH: I agree with both of them on that one. I love the way Rick can have a movie that’s this much fun but have so many moments that are profound. You sit there and think, “Oh wow, that makes me think and feel something.” One of my favorite scenes is where Wyatt Russell’s character Willoughby is speaking with [Blake Jenner’s character] Jake Bradford and says “just be weird” and when you do that you bring who you are and never who they want and that’s when it’s fun. There’s something great about that. It’s just so much more fun when you stop trying to be something that’s an expectation as opposed to embracing what you are and running with it. JB: The casting for this movie is spot on from top to bottom. What was the audition process like? Did you have to audition for the acting and the baseball? BJ: I think we were all invited the first time, it was like an interview talking about yourself, your hobbies, what you liked to do, what kind of person you are. After that, we were invited back to play with some dialogue. We were asked to put a baseball tape together of our baseball experiences/talent. Then after that, a couple of more auditions and that was it. RG: Most unique process ever. PMG: Do you have a favorite movie of Rick’s? RG: Dazed and Confused. I love the Before series. A Scanner Darkly. TH: I’ve never seen that. RG: Oh man, it’s so good. TH: I really loved Boyhood. I thought that was such an amazing accomplishment. I love the fact that it’s one of those movies that over the course of that many years, you would assume that there would be that one moment in the movie that would be that life-shattering altering moment, and I loved that by the end of it, it was just these little moments and conversations in life that can shift it and that can skew your opinion about something and make you who you are. I loved it. Absolutely loved that about the movie. BJ: No one says School of Rock. RG: School of Rock’s awesome. PMG: Is that your favorite, Blake? As a musician? BJ: It’s one of them. One that I really enjoy watching, I’ve seen it a few times, is Waking Life. I really dig that. I dig all of his movies. I think Bernie is awesome. It’s the best Jack Black’s ever been. Waking Life is cool; tapping back to what I said about living the now. There’s something a little different that anyone could take away from it when they watch it. The conversation shifts back to Everybody Wants Some!! JS: Did any of your wardrobes change at all? Wardrobes/playlists? RG: Playlists changed for sure. TH: Wardrobe…I’m still trying to get ahold of some of those pieces. PMG: There are some amazing patterns on those shirts. RG: I don’t think I can fit in those shorts anymore. TH: The shines coming up from some of those shirts were pretty blinding. The fluorescents. PMG: (to Tyler) Will you be donning them in Fifty Shades Darker? TH: I am on a strict N.D.A. (non-disclosure agreement) with that. RG: (while laughing) No comment from him. PMG: Are you done filming that? TH: Yeah. I’m done for now. And just like that our time with the guys was over as they were whisked off for more interviews. If you’re a fan of Richard Linklater’s, go see Everybody Wants Some!! You’ll grin and chuckle the entire time.